Katherine Frazier declares her desire to be received as an Adrian Dominican novice. 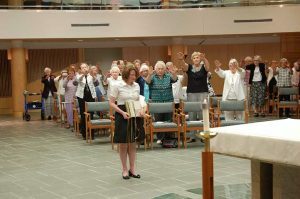 August 12, 2016, Adrian, Michigan – During a special August 8 Liturgy marking the feast day of their founder, St. Dominic, the Adrian Dominican Sisters formally received Sister Katherine Frazier as a novice. Sister Katherine will begin her 10-month, canonical period in the Collaborative Dominican Novitiate in St. Louis in mid-August. There, she and two novices from the Dominican Sisters of Peace will experience Dominican community life, prayer, study, and ministry as they discern their call to vowed life. Sister Katherine, a native of Fort Wayne, Indiana, entered the discernment process with the Adrian Dominican Sisters as a pre-candidate two years ago. 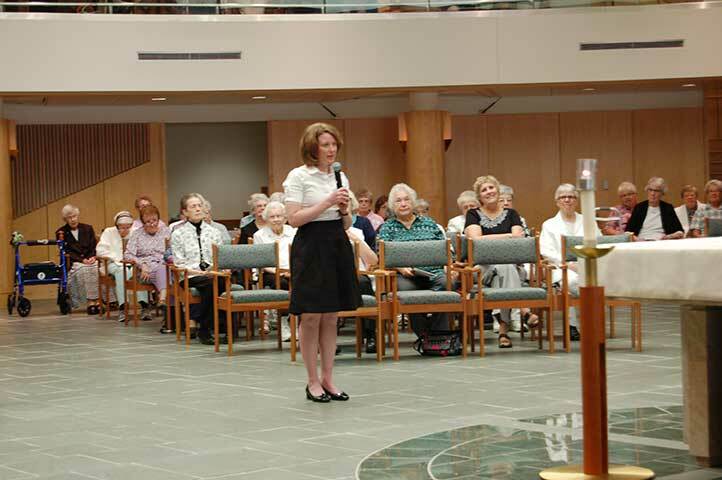 During this period, she continued her ministry as director of the Bishop Donald Trautman House at Gannon University in Erie, Pennsylvania, while connecting as often as possible with the Adrian Dominican Sisters. She formally became a Candidate – entering into full-time discernment with the community – on the Feast of St. Dominic in 2015. During this past year, she studied the Congregation’s identity and history and ministered in Adrian and Detroit, Michigan, and in New Orleans. The older of the two daughters of Lee and Lynne (McKenna) Frazier, Sister Katherine holds a bachelor’s degree from St. Mary’s of Notre Dame, Indiana, and a MPhil in world archaeology from the University of Cambridge in Cambridge, England. Sister Katherine, holding a copy of the Adrian Dominican Sisters’ Constitution, receives the blessings of the assembly. During the Rite of Reception, Sister Patricia Siemen, OP, Prioress of the Adrian Dominican Congregation, formally examined Sister Katherine on her desire to be “received into the Congregation of the Dominican Sisters of Adrian as a novice, and to experience more fully [their] way of life in faithful observance of [their] Rule and Constitution.” Sister Katherine received a copy of the Congregation’s Constitution with the mandate to study and reflect on that document as she continues her mutual discernment with the Congregation. The Liturgy was also a special celebration of the 800th anniversary of the foundation of the Order of Preachers, more popularly known as the Dominicans. Noting this anniversary in her reflection, Sister Pat described Dominicans as “men and women who for 800 years have been bringing good news to mountain tops and in the city streets.” She speculated that St. Dominic – who had compassionately refuted the heresy of his day that the material world is evil – would want today’s Dominicans to preach “a salvation of liberation, compassionate, and wholeness” and address today’s heresies of individualism and excessive materialism.